Aroostook County – The countdown is on for Aroostook County’s hosting of the 2016 International Biathlon Union World Cup. At a press conference in Mars Hill today, officials announced the dates and early details for when the world’s top biathletes will converge on northern Maine for the eighth in a series of nine stops on the 2015-2016 circuit. Aroostook County is the only stop in the USA. 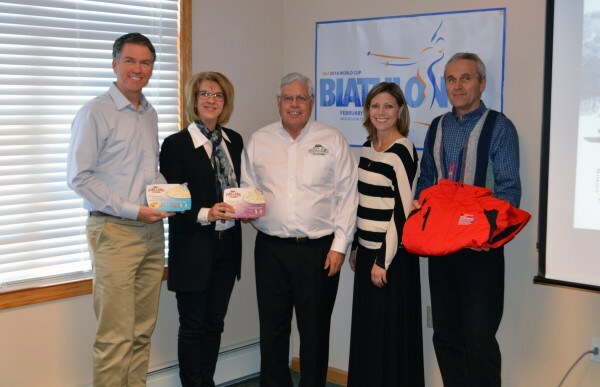 The information was shared at the administrative offices of the Pineland Farms Naturally Potatoes processing facility in Mars Hill, along with news that the corporation will come on-board as a lead partner/sponsor at the gold level for the first Biathlon World Cup to come to U.S. since 2011 – when it was last held in Aroostook County. IBU World Cup 8 will be hosted by the Nordic Heritage Sport Club at their world-class Nordic ski and biathlon venue with competition dates planned for February 11 through 14, 2016. Teams and visitors from the participating countries are expected to arrive in Aroostook County three days prior to the start of competition and depart the region on February 15. Paul Towle also acknowledged the contribution of the Maine-based Libra Foundation, who recently announced their support for operation and maintenance of the Nordic Heritage facility as key to the club’s ability to move forward with hosting such activities. The club president also noted the importance of the revenue generated for both the organization and Central Aroostook region when such events come to northern Maine. Jane Towle, event director for the 2016 International Biathlon Union World Cup who has been involved in leadership capacities in the hosting of several such events that have come to The County, underscored the economic development, cultural and social benefits that come each time the region has the opportunity to shine on the world stage. The event director announced that upwards of 300 of the world’s top male and female biathletes, ages 20 and over, from more than 32 countries are expected to be in Aroostook County for the competition. The biathletes will participate in six competitions at the Nordic Heritage Sport Center venue: sprint, pursuit, and relay in both men’s and women’s divisions. Organizers, joined by representatives from Pineland Farms – the first 2016 event partner/sponsor to come forward, also unveiled the official event logo. The logo prominently features the word biathlon in a lighter blue with a more deep blue image of a cluster of pine trees appearing in the letters. A silhouette figure of a biathlete in motion appears as though skiing out of the word biathlon. The concept for the logo was originally used in 2014 when Aroostook County hosted the IBU Youth/Junior Biathlon World Championships. The intent at the time was to create a unifying brand for national and international biathlon events held at the Presque Isle venue. In the coming weeks, the Presque Isle Organizing Committee will finalize leadership roles for the 2016 event. Officials will also begin to have conversations with other area organizations to formally request support and partnership. As those efforts get underway, event leaders are thrilled with the early support announced today by Pineland Farms Naturally Potatoes. The Gold event sponsorship was announced by company President and Chief Operating Officer Rodney McCrum, who cited the parallel between the success of the Mars Hill potato production facility and the great results of the volunteers and communities who have hosted world-class winter sports events at a world-class facility in his backyard. “The great products and successful results that we see here in our facility and outstanding events such as the coming 2016 IBU World Cup are to the credit of the hard work and dedication of the people of Aroostook County. Our support for this event is in recognition of these folks and the tremendous work ethic they possess. From the hardworking growers we rely on to provide the potatoes for processing and the innovative workers that ensure our products get to market, to the community leaders and hundreds of volunteers who ensure every detail is cared for and a warm Aroostook welcome is extended when we host such events – it is the people who make it possible,” said McCrum. Founded by fourth generation farmers, Pineland Farms (Naturally Potatoes) believes in family farms, preserving the working landscape, providing innovative concepts and using only fresh, high quality ingredients. The fast-growing business is focused on creating excellent food products in ways that sustain the environment and jobs, and encourage the growth of Maine agriculture. The state-of-the-art Mars Hill facility, located among 55,000 acres of homegrown potatoes in Aroostook County, produces refrigerated potato products. The processing and packing process they use retains the taste and texture of the finest fresh potatoes, while providing customers the convenience of no peeling, dicing or thawing, which reduces preparation while not sacrificing quality. The 2016 World Cup is the latest in a number of national and international Nordic ski and biathlon events to be hosted at the Nordic Heritage Center. The most recent such activity was the IBU Youth/Junior Biathlon World Championships in late February/early March 2014. The last World Cup hosted in The County, in February 2011, had stops in both Presque Isle and Fort Kent. The 2016 event will mark the first large-scale event hosted in The County since the Nordic Heritage Center has operated independent of direct support provided by the Maine Winter Sports Center. The operation and maintenance of the world-class four-season sports facility, located just off the Fort Fairfield Road in Presque Isle, are supported in large-part by the Libra Foundation, as well as local businesses and organizations, other donations, club memberships and revenue generated by events, including those sanctioned by the International Biathlon Union.